There weren’t many candy bars that I liked as a kid. Skor bars were one of my favorites. I loved the combination of the rich, buttery toffee and the creamy chocolate. Those candy bars were the inspiration for these toffee chocolate chip cookies. The cookies are soft in the middle with chewy edges. The toffee pieces and the dark brown sugar both give the cookies that rich toffee flavor, and they go perfectly with the chocolate chips. 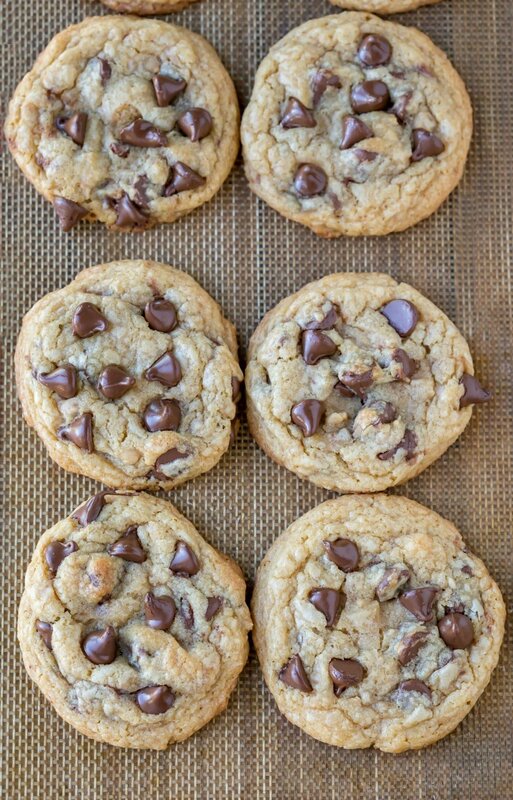 These toffee chocolate chip cookies are incredibly easy to make. I stir them up by hand – no mixer needed. Also, I chill the dough to help the cookies keep their shape. If you don’t chill the dough, the cookies will be thinner and crispier. So, if you want a chewier cookie, make sure you don’t skip that step. 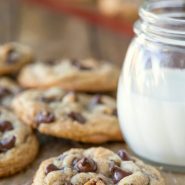 If you’ve tried this toffee chocolate chip cookie recipe, don’t forget to rate the recipe and leave me a comment below. I love to hear from people who’ve made my recipes! You can SUBSCRIBE to receive my latest recipe newsletters or FOLLOW ME on FACEBOOK, INSTAGRAM and PINTEREST for even more delicious food. 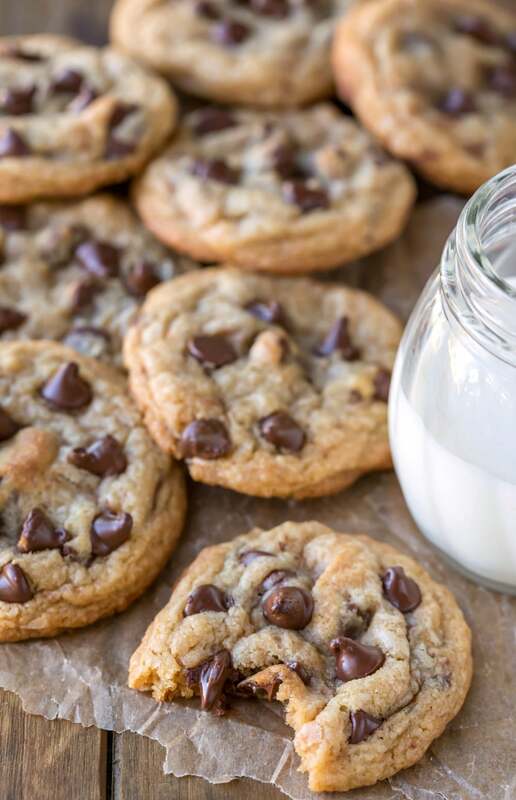 Chewy toffee chocolate chip cookies are packed with toffee pieces and chocolate chips. Stir in toffee bits and chocolate chips. I like to chill the dough for at least 30 minutes to give the ingredients a chance to meld. Bake for about 8-12 minutes, or until the edges of the cookies are golden brown. *Be sure to avoid packing the flour when you measure. I fluff, scoop, and sweep. **I like to mix these cookies by hand to avoid over-mixing the dough. Good! I’m glad that you liked the cookies! =) Thank you for commenting. What about using bread flour ? Halved this recipe and used the heath milk chocolate toffee bits. Came out perfect! Holy crap these are good!! I’ve made a few of your cookie recipes, they’ve all been great. Thank you for sharing them! Uh, these are amazing! Don’t know how someone could mess these up, they’re so good! Can’t wait to try more of your cookie recipes. Didn’t work well for me for some reason. I followed the directions but I think the temperature is a little too high. They tasted fine. Some were a little raw in the center as they didn’t flatten much. I’m sorry to hear that! I’m glad they tasted good at least! It’s definitely important to know your oven because there can be so much variation from oven to oven. The other thing that can cause what you described (cookies staying raw in the center and not spreading) is having too much flour in the dough. Either way, I wish you better luck with your next batch! Hi! Great recipe! The cookies were soft in the middle and chewy outside – just the way I like them! Hi Kate. Have to tell you, I made the cookies and they were NOTHING like yours. I’ve read over the recipe and instructions several times, and there’s only one thing I did different. My grocery store didn’t have toffee chips but did have the milk chocolate toffee chips, so I used those. Mine were a solid light brown color, they didn’t flatten, and texture was not that of a choc chip cookie. Do you think the chips would have made that much difference? I bake often (too often?) and have never encountered a problem like this. I’m anxious to hear your input. Thanks. PS: I have another cookie recipe that I make very often, that calls for a whole bag of the milk choc toffee chips, and it doesn’t affect the cookie color. Hi! I’m sorry to hear that you had trouble with the recipe! I’ve only used the chocolate covered toffee bits once, and I had a bad experience with them. I used them in one of my tried-and-true recipes, and the chocolate melted into the dough and left me with a greasy mess. Could you please tell me more about the texture of the cookie? The first thing I think of when a cookie doesn’t flatten is that there was too much flour in the dough, but you said that you bake often, so I’m guessing it wasn’t any of the common issues (old baking soda, oven temp was off, etc.). OMG!!!! I’ve made a million cookie recipes and these are the best cookies EVER!! 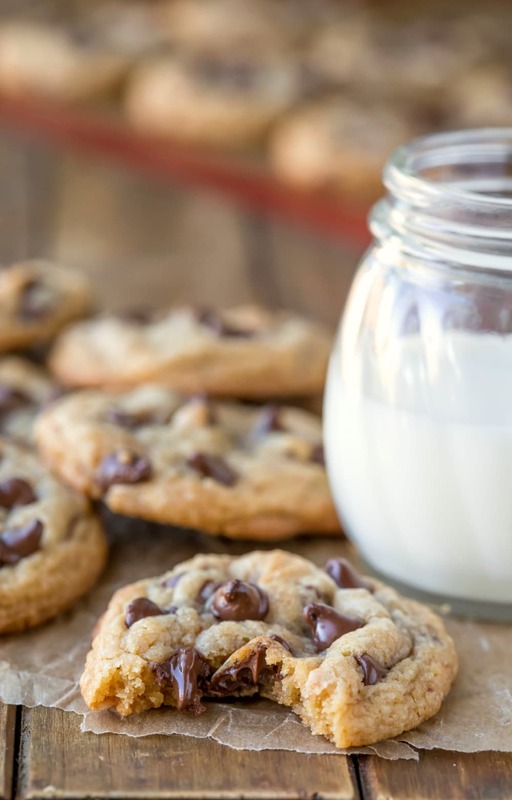 There is nothing I love more than a good chocolate chip cookie! These look amazing!